WEDNESDAY 13 has revealed the video for "What the Night Brings", the first track taken from his forthcoming album, Condolences. The album is the first release for his new record label home — Nuclear Blast Entertainment. Watch the video for "What the Night Brings" on KNAC.COM HERE. The track is now available at iTunes, Amazon, and all good DSPs. Fans can pre-order the Condolences album in an array of different digital and physical formats, including a few limited-run, colored vinyl versions. 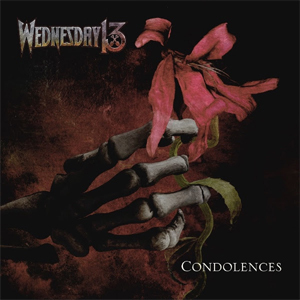 "I'm really excited to unveil the new video for "What the Night Brings", the first track from our upcoming album, Condolences," WEDNESDAY 13 said. "It kicks off our new album and really sets the tone for the rest of it. We worked on the video with director Matt Zane and he really helped bring a spooky vibe. The song reminds me of a heavy metal version of The Nightmare Before Christmas theme!" He continued, "It was also a lot of fun filming the extra scenes, too, where I get to dress up like a demon at a ritual! I never knew that singing with fangs would be so difficult, but I made it work!" Condolences will be released June 2, 2017 via Nuclear Blast Entertainment. The album was produced, mixed and mastered by Chris "Zeuss" Harris (HATEBREED, ROB ZOMBIE). Artwork was created by Travis Smith (OPETH, KATATONIA, NEVERMORE). WEDNESDAY 13 is confirmed to headline the Dogtooth Stage at Download Festival on June 10, with his full electric set, as well as two additional shows in Dublin (June 8 at Voodoo Lounge) and Belfast (June 9 at Limelight 2). Download tickets are available HERE and the other tickets are available HERE.